HomeHormonesIs your oestrogen to blame for your headaches? No word of a lie, two migraines in four days had my mind in a spin. Actually, four days out of action gave me so much time for contemplation and analysis – for me, not something I’m necessarily used to having. First up I have to say it was not one bit fun. If you suffer from migraines, you’ll be no stranger as to how your pattern goes. It also seems that everybody’s signs of onset vary but one thing is constant, the intense pain and the aftermath. One things is for sure, migraines are made of the kind of material that stop you in flat your tracks. I used to be a regular migraine sufferer way back in the day where intense pressure, due to study was full throttle. The memory has never faded mostly because they were so epically violent. I learnt very quickly that from the first sign of aura vision, I have roughly 30 minutes to bunker down before the pounding and drilling sensations into my brain would set in. That, of course for me is after the vision goes and I’m left with a teen tiny hole, the size of my pinky fingernail nail to see out. Try driving a car like that! Another memory that will never leave as a young woman fanging it home from the shops trying to drive with very little vision. In hindsight, extremely unsafe, but in that moment all my attention was focused on getting home and getting to bed. I remember studying migraines during my Chinese Medicine teachings and learning about various types of headaches and how to treat them. Perhaps a reason I’m so fond of Chinese Medicine, because it gave me answers that nobody else seemed to be able to provide – it not only looked at treating the symptoms at onset, but over time, the root cause. The nature, presentation, duration, location, time in the menstrual cycle and the host of symptoms that come with the nail driving sensations were all important in it’s treatment and prevention. As always, my mind wants to understand not only the best way to treat an ailment, but piece together from a physiological sense why it happens. Migraines, I’m still slightly scratching my head about, but I’m slowly learning two things. Firstly, science can tell me bits and pieces but we’ve still got a lot to learn. Secondly, from what we do know, I can string together what I think is going on. If we sit and look at the triggers of migraines, we can put pieces of the puzzle together. So if we can look at what might cause migraines, we then need to look at physiologically what is going on in your head (it’s like somebody is holding a party in there, but your not necessarily invited.) Migraines, are thought to be a result to changes in the brainstem and how it impacts the trigeminal nerve – that is a major pain pathway (hence the feeling of being bashed in the head by a baton). This is thought to lead to an imbalance in brain chemicals, I assume as a response and coping mechanism to the physiological changes in the brain and as a means not only to protect ourselves but warn us that something isn’t quite right. The impact on serotonin – that is the hormone that helps regulate pain is also thought to be involved although not fully understood. That said, if we know serotonin helps regulate pain and migraines hurt so damn much, it’s pretty simple to join the dots and know that whatever is going on in there is wildly pulling a hand break burn out on serotonin. This causes the trigeminal system to release neuropeptides which travel to the outer area of your brain (the meninges) which results in intense pain. With both physical and chemical reaction going on, it’s quite easy to see why the symptoms are so wide and varied and just why migraines stop you in your tracks. Now of course some of these cross over, for example many of these factors will affect our hormones and cause a change that can trigger headaches, but as a guide if we can work out the causative factor we can begin to repair or change the stimuli that is causing the headache in the interim whilst we help the body to recover. My 2 headaches in 4 days were not triggered by the same factors. My initial headache I believe was a result of intense stress, the second less than 48 hours later was triggered by strong chemical exposure. Potentially if my body hadn’t been under great stress and I had not have had the first migraine, the second possibly wouldn’t have been triggered. But step this back a little more and my migraines have also been more frequent since I increased my exercise over the past few months. So when I add all of this up, I can see it’s musculoskeletal -> stress -> chemical induced. Knowing this I can work backwards to ensure that I really get a grasp on whats going on. Hands down I know minimising stress is without doubt one of the hardest but most common issues when it comes to headaches. Want more on how to control and manage (and FREE yourself from) stress – check out my e-course Debunking Stress here. Looking at the causative factors, it’s up to us to individually analyse what’s going on in our own body. We can look at our triggers, understand the environmental influences and set about a means of making change to see the impact. What might be a little more difficult for us to understand is how our hormones play out during headaches and migraines. You might not be a full blown migraine sufferer but you do suffer from intense headaches all the same. Understanding what your hormones are doing in these times can help to take you to your best and really get control over your body. When it comes to hormonal headaches, let’s keep it simple; it’s all about controlling your oestrogen and making sure you have enough of the good stuff – progesterone! + Stress (cortisol one of our stress hormones bosses around progesterone -> progesterone and oestrogen need balance -> excess cortisol indirectly increases our oestrogen levels as cortisol puts a lid on progesterone). + Chemicals be it in our environment, body products, cleaning products, foods etc. Most of these chemicals mimic oestrogen (they contain xenoestrogens), meaning your body doesn’t know the difference and the end result is raised oestrogen. + Diet will also influence oestrogen. Alcohol, caffeine, various non organic produce (think broccoli, whilst amazing for hormones is so heavily sprayed with chemicals it is counterproductive – know which foods are best organic and which you can relax on) can all contribute to raising oestrogen levels for the same reason as chemicals listed above. Also not consuming enough fiber can contribute too. + Weight gain – that’s a vicious circle since fat cells also make oestrogen. More fat cells equates to higher oestrogen. This isn’t limited to headaches, but really oestrogen on the whole which can raise a host of symptoms. + Address stress. I’ve mentioned my ecourse. It might be time to take a break, even some time off or commit to changing your work-a-holic mentality. Applying the 8 + 8 + 8 rule is what I advocate for my patients. That is eight hours of each play, work and sleep. Whatever you are currently doing, try and commit to change and see where that takes you. + Rest. Chinese medicine is a ranging fan of having you in bed around 10pm because that’s when the magic happens. It’s believe that this is when the body begins to optimally build blood and recover from the day. Science tells us this too – being in bed around this time facilitates optimal production of melatonin (this hormone also helps address oestrogen). If you have trouble sleeping – this may be part of the problem. Take yourself off to a good Chinese Medicine practitioner or visit us at my clinic The Pagoda Tree – we will absolutely be able to help. + Switch out foods that are raising oestrogen and triggering headaches and add in foods that help balance oestrogen out. As mentioned alcohol and coffee are two main offenders that will raise oestrogen and cortisol. Leave them out for a while alongside any foods that trigger your migraines (chocolate, cheese etc). Also ensure your meats and poultry and dairy are organic for the same reason and keep consumption lower – roughly no more than a fist size amount in a serve. This also extended to adding in enough fibre. I’m a MAD fan of prescribing psyllium and slippery elm to my patients for this reason. Fiber helps to lower oestrogen. I have patients add a mix of the two (slippery elm and psyllium) to diluted apple juice each morning. Go for around a heaped teaspoon amount of the two mixed as a good guide. + Increase exercise. The trick is finding the right type! Short bursts of intense exercise or longer bursts of low intensity I find to be best. Exercise helps decrease oestrogen levels and helps make more of the right type of oestrogen. It’s also a fabulous stress buster and releases the feel good hormones too. + Ditch the chemicals. As outlined, chemicals in our daily life contribute to increase oestrogen levels. Rather than making this an overwhelming task and throwing out your entire supply in once go, I suggest as each needs replacing, to switch for the friendly, more hormone supportive alternative. Think switching cleaning products for their greener friends, body products for those by the likes of The Divine Company or Kora. Check out Depths of Beauty for the complete guide to your make-up case overhaul. + Consider a cleanse. Your liver plays a huge role in hormone detoxification and conversion. When the load of life and exposure to chemicals and toxins in everyday living begin to take their toll, this can place great strain on our liver. What’s more, our gut need all the support it can get. We are living at a time where our digestive system’s are placed under great compromise from medications, stress and inflammatory foods and daily living. If we can’t adequately absorb nutrients, we can’t go on to make superpower hormones! This is one of the reasons why I created my Cleanse Yourself program. It’s a super simple start that will allow you to pave the way for happier hormones all round. Sometimes a direct targeted approach is also needed, seeking the help of your health care provider can really put the finishing touches on balancing out your hormones. I’d love to help you more if that’s the case (I do offer skype consults too). My best suggestion, see if you can pin point your triggers and work on minimising them whilst regulating your hormones at the same time and see where that takes you. It’s what you do day to day that makes the biggest difference and putting the wheels in motion is where it all begins. Need some accountability? Here’s an idea! This year I’m amongst Australia’s greats in wellbeing as an ambassador for FebFast – where we ‘pause for a cause’ raising money and awareness for disadvantaged youth. This year, FebFast is extending the fast by offering the option to avoid either alcohol OR sugar for the month of February. Why don’t you join me – I’m stepping up and pausing on both sugar and alcohol for the month of February. It’s a great way you can do something for the community all the while your health benefits too! For more details head to their website – www.febfast.org.au. Share this one around – we all suffer from hormone imbalance from time to time depending on what’s going on in our own worlds, help your loved ones understand their body more and hit the ‘share’ button. Got something to say? I’d love to chat with you in the comment section below. Hi Nat, just wondering if there is any further data on migraine/headaches on different sides of the head/brain? Recently, in the days leading up to a migraine, the left side of my head above my ear will swell slightly, but enough to bulge out either side of the arm of my glasses. And the scalp is also very sensative to touch. And then the migraine, when it comes also manifests on this side. Never happens on the right side. Could this (side) be a further indicator for what is happening or causing to migraines? I would think that this has to do with where the nerve is impinged – but most commonly headaches are on the right. I think this would be because people are most commonly right handed and the strain on the right is greater than that on the left. Migraines can change sides but it’s not common. Thank you so much this was so relevant to me and has given me greater understanding as I have been a sufferer of migraines since I was 12 now I have other hormonal issues pcos and high risk of ovarian cancer due to my mum passing away from this last year. Have been told by gyno ro change diet to minimize oestragen but now reading this all the pieces fit thanks from the bottom of my heart! What state are you in?? Great article and good to see all the information laid out as such. This is absolutely me (& my brothers, mother and pretty much everyone on my mother’s side of the family!). Have had the exact same experience with auras – racing home before I lose all vision, feeling like someone has take a photograph with the fllash on a hundred times over. I found my migraines signfiicantly reduced with good diet, sleep, a balanced amount of exercise and regular Chiro/massage appts every 4-6wks (to help with you guessed it, C2-4!). I’ve since delved deeper into the world of natural food chemicals after the birth of my daughter who was an extremely restless baby and I started to realise food was most likely the culprit. I’ve got a brother who was affected by foods (A.D.D) so I was somewhat familiar with it all. We went down the road of the Elimination Diet and failsafe eating for my daughter. We now control her amine and salicylate intake (low amines, mod salicylates & high salicylates occasionally. This means a happy baby who sleeps ten times better and doesn’t display fiidgeting, obsessive behaviour. When we went through the elimination I did it also as I was breastfeeding her at the time. What I discovered was how much diet affects me also (& everyone to varying degrees!). 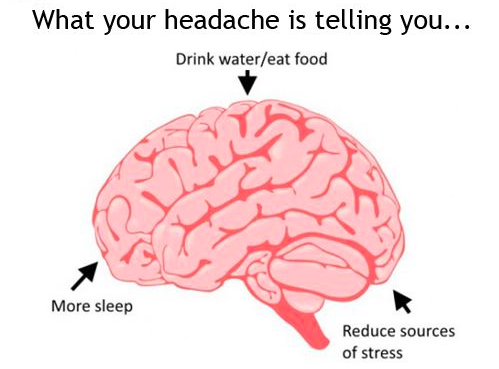 I already knew that chemicals- perfumes, deodorants, cleansing products etc could trigger a headache/migraine for me, especially if I’m feeling “headachey”. I also knew that certain foods – like wine, cheeses, chocolates etc could trigger headache/migraine – now I know that those foods and “etc” are foods high in amines and I’m best avoiding them. I still do eat them but I also now know that if I’m coming to that time of the month or stressed and likely to get a headache, to avoid those high amine foods (as well as perfumes etc). My dietian likened it to a cup and when your cup is filling with daily stress, muscular stress from exercise, some strong perfume or foods that may affect you is enough to make your “cup” overflow and Viola… Migraine … Or anxiety… Or whatever symptom you experience. Do you offer skype consults Nat? Ps. This page keeps switching letters around so my email is not entering correctly. The “i” and the “f” need to be switched ! Hi nat. Thanks for your article. I have had migraines for the past 30 odd years. Mine have decreased significantly since having kids but now and then get some doozies! I get auras, paralysis down one side of my body and intense pain. I had one last week where i couldn’t speak! I think mine is hormonal especially if i eat something bad such as msg etc a few days before my period. Unfortunately my 11 year old daughter is also getting migraines. Whilst she hasnt started her period yet, is there anything we can do for her, other than monitoring when she gets them? I think I might have to arrange a time for us to both come in for a chat. Sorry for the lengthy post. Thanks for listening! This article couldn’t come at a better time!! I have always been oestrogen dominant but I know it’s getting bad when I get severe anxiety. So I’m trying to detox my body, particularly my liver which is at high levels but a bit concerned in how to do this the right way, as I’m currently breastfeeding. I started taking a few supplements (molybdenum, esstroscence & magnesium) but for the past 2 days it’s given me migrains which is making it hard to breast feed my 12 week old baby. I’m also concerned while detoxing if it will go through my milk supply & unsettle my bubs. My head is in such a fog. I’m not sure if I’m doing the right thing or not.